Which Functional Life Skills Should We Teach To Our Teenage Boys? This entry was posted in Mental Health and tagged Adolescents, Coaching, Pare, Trust on July 20, 2016 by Jacquelyn Ekern, MS, LPC. As a parent or caregiver of a teenage boy, you may be overwhelmed at times when you’re trying to figure out the best way to help your son navigate through a transitional time in life. With the vast amount of information, parenting books, philosophical approaches, and schools of thought that are available and accessible, many parents may question if they are raising their teenage boy “correctly.” That means are they leading their child appropriately or helping guide him to one day become a capable and accomplished adult? Parents and caregivers of teenage boys have the potential to make a positive impact in the life of their child and may underestimate the influence they might have in their son’s character development. While parents are often in competition with the latest fads that may be circulating through school or the influence of a circle of friends, the example, direction and guidance of a parent is invaluable in the life of a growing and developing teenage boy. Ultimately, parents who lead by example impress a strong and lasting influence on their teenage son, who can observe firsthand which qualities make for a successful and capable adult. Additionally, parents who can successfully model and teach functional life skills are setting a basic foundation for their teenage son, from which the child can positively develop and grow. Which Life Skills Are Essential? When looking at the many skills a teenager must master in order to become a capable adult, this can be overwhelming for a parent guiding their son. It is important to know that functional life skills are modeled and taught little by little and should be increasingly built upon, beginning from childhood through adolescence. One way to help a teenage boy effectively develop a functional life skill is not only to model the behavior but also to delegate age-appropriate responsibilities as the teenager grows. For example, in teaching a teenager how to effectively handle finances, it is important to begin on a smaller scale with responsibilities that are challenging, yet attainable. Breaking down skills and tasks into doable steps can also help a teenager develop new abilities as well as learn systematically how to execute a basic life skill. Another idea for teaching functional life skills may include the use of visual guides, which can be effective when teaching a new task. In parenting and working with your teenage son, exemplifying patience, understanding and flexibility are always important. Remember that your teenager is looking to you for guidance in an area in which he has no expertise, and each teen will take the necessary time he needs to master a new skill or task. If you have other children in your household, try not to compare the growth and development of your teenage son to the progress of his siblings. You are investing time and effort into raising a capable adult, and this time is not futile nor wasted energy. Functional life skills are foundational for independence, self-esteem, health, safety and more for your growing teenager. 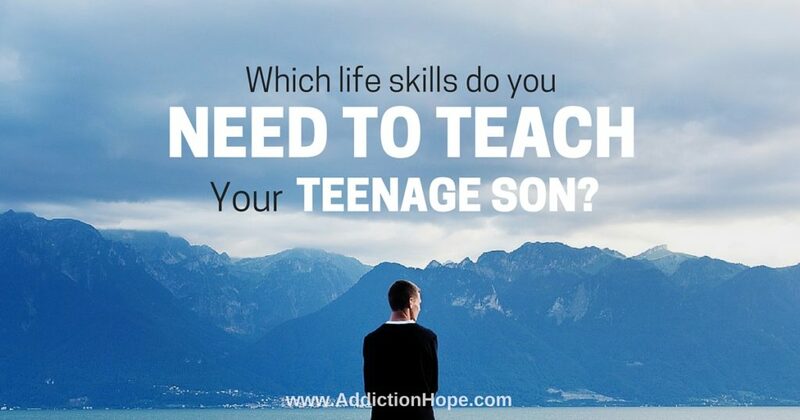 If you have parented a teenage boy, what were some effective ways you modeled and taught functional life skills to your son? What encouragement might you have to others who are in this phase of life with a teenage boy? Please share your experience and advice in the comment section.